When I first discovered companion planting it was like a light bulb got switched on. It’s such a big part of an organic food garden and forms one of the key concepts. This concept involves working with nature and using natural practices to benefit your crops. Among the many companion planting options you can use in your food garden, in my opinion, flowers are essential to the mix. Let’s take a look at some companion flowers for autumn and how you can use them in your food garden. 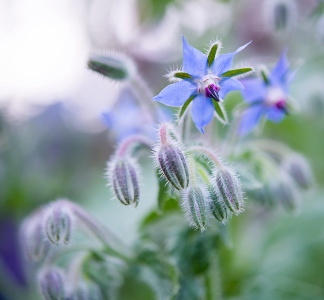 For the warmer regions, borage can be grown from approximately September through to May. I love borage and the flowers are edible too. It’s quite a delicate flower and tastes pretty sweet. Borage adds trace minerals to the soil which in turn improves both flavour and growth of plants like strawberries and tomatoes. 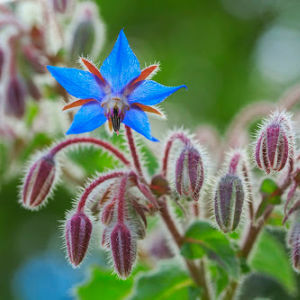 The bees love borage and planting it near tomatoes will not only help with pollination but will also mask the smell of the tomatoes from pests. You can also plant near your brassicas as it’s said to deter cabbage moths as well. We like using nasturtiums as a sacrificial plant. They are way too lovely for the pests (aphids in particular) to ignore. 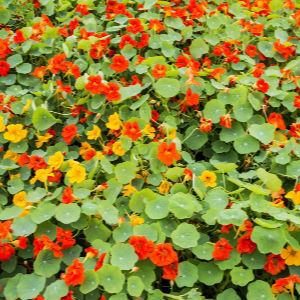 Nasturtiums are a great companion plant for vegetables and roses. As the aphid population on the nasturtiums grows, it attracts ladybirds and other aphid-eating insects so that the problem often resolves itself. Luring aphids to one plant can also make them easier to deal with if you plan to practice your own methods of control. 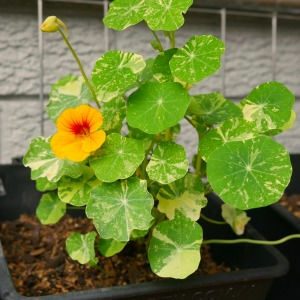 Besides handling aphids, nasturtiums are a good companion plant because the lovely flowers attract pollinators. 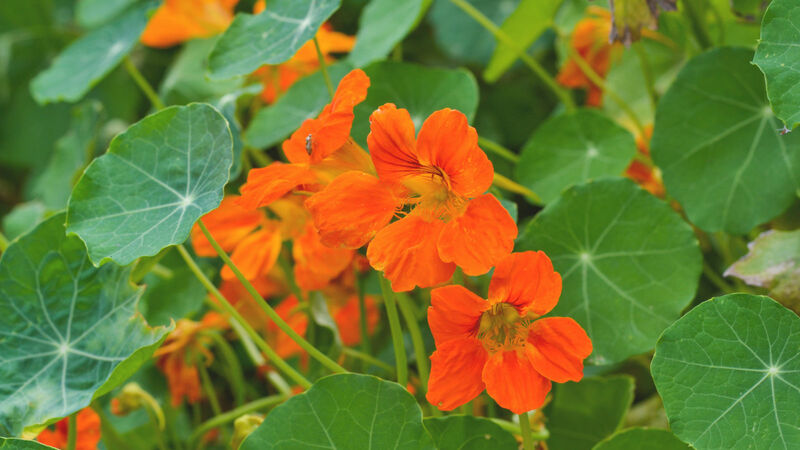 Plant your nasturtiums near your brassicas (Asian greens, Brussels sprouts, broccoli, cabbage, cauliflower, kale, rocket etc). Nasturtiums are an edible flower so you can also use them to pretty up your salad bowl or blend to make nasturtium pesto. 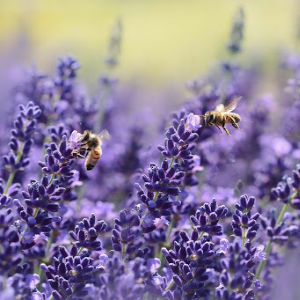 Lavender can be used to mask the smell of plants so it’s referred to as a repellent. It has an incredibly strong smell and can deter whiteflies and aphids, even fleas and mosquitos don’t like it. It’s a great companion for silverbeet, cabbage and most of your herbs. You’ll simply adore the flowers but the bees will as well, so it’s a valuable flower to have around to help with pollination this autumn. 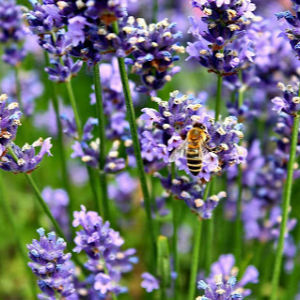 Plant in full sun and enjoy the diversity lavender brings into your food garden. In the tropical and sub-tropical region, marigolds will grow all year round but they are pretty tough. They will tolerate a wide range of growing conditions. 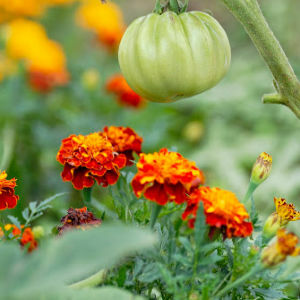 Marigold companion planting is said to enhance the growth of basil, broccoli, cabbage, cucumbers, eggplant, gourds, kale, potatoes, squash and tomatoes. Marigold also makes a good companion plant to melons because it deters beetles. 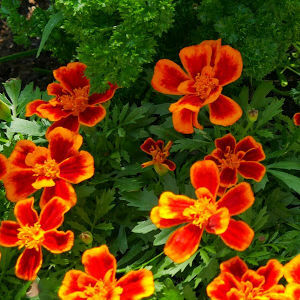 It is also used to kills root-knot nematodes and eelworm because the roots of French marigolds produce a chemical. This chemical is so strong it is an effective pesticide for years after the plants are gone. You’ll find they attract lots of beneficial insects into your garden as well. If your climate loves them, plant some marigolds with your autumn crop. If you haven’t heard of land cress before it will soon become your favourite pest control, especially for your autumn brassica crops. 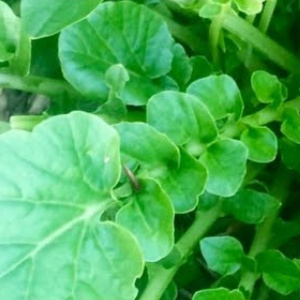 Land cress releases chemicals which attract two moths called the Diamondback and the cabbage. You are probably more familiar with the cabbage moth and its cheeky caterpillars. The moths lay their eggs in the land cress then the hatched caterpillars feed on the land cress. Because the leaves are like a poison to the moths they die straight away. I know right, why haven’t you heard of this amazing plant before? Land cress also attracts the butterfly but unfortunately doesn’t kill its caterpillars. However, it does still lure them away from your crops, which is an awesome organic pest control strategy for autumn. 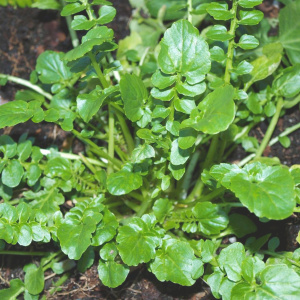 You’ll be happy to know that land cress is a deliciously peppery edible. Companion flowers are a great way to add some diversity into your autumn food garden and help your crop by using natural techniques. Not to forget some amazing colour and the benefit of keeping your food garden organic and free of chemicals.